The bank cut its price target to $US195 – 35% below its current level – after realising no funding had actually been secured. JPMorgan has cut its price target for Tesla by 36% to $US195 a share as questions continue to surround the electric-car maker’s bid to go private. “We are reverting to valuing Tesla shares on the basis of fundamentals alone, which entails a $US113 reduction in our price target back to the $US195 level where it stood prior to our August 8 note in which we newly weighted 50% in our valuation analysis a go private scenario for which funding was at that time said to have been secured to take the company private at $US420 per share,” analyst Ryan Brinkman wrote in a note to clients out Monday. 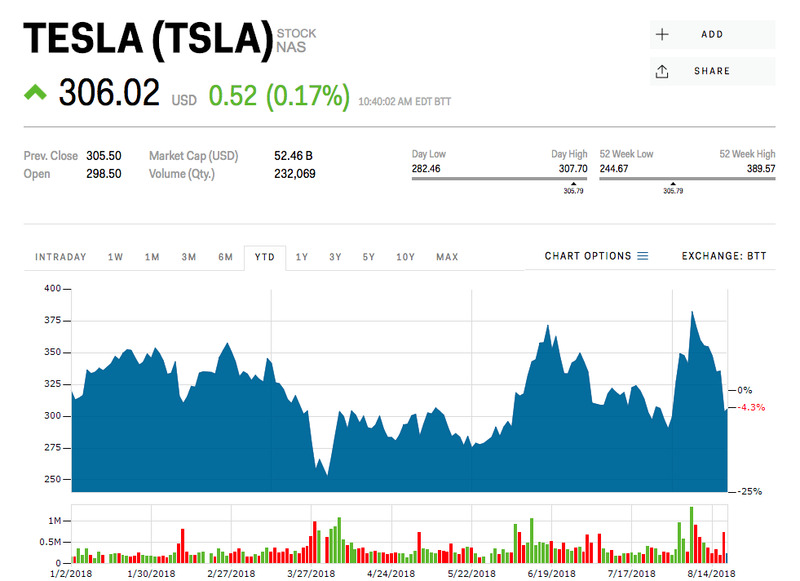 In a blog post six days after his “funding secured” tweet, Tesla CEO Elon Musk explained that the announcement came after a meeting with Saudi Arabia’s Public Investment Fund – which is reportedly in talks with a Tesla competitor, Lucid Motors. Those talks, according to Musk, left him feeling confident the kingdom would invest even more than its current 3% to 5% stake, helping him take the company private.